ESPN commentator Alex Dimond has stated that Rory McIlroy needs to fire his caddy JP Fitzgerald if he is to “save himself from himself” after he hurt his hand in yesterday’s first round of the PGA championship, the year’s final major. McIlroy hurt his hand trying an impossible shot, to move the ball away from tree roots on the third hole. He needed on course treatment before continuing and may be forced to withdraw. First to criticize McIlroy was commentator Jay Townsend who clashed with McIlroy after the British Open. "I think Rory might have hurt himself by hitting a tree root, smart play??? I'll let you all decide," was the mocking tweet Townsend sent out. 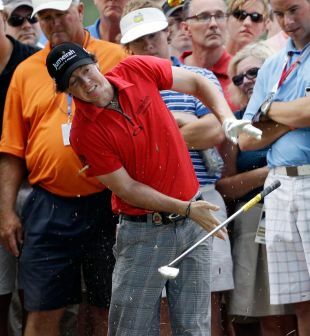 Dimond says Fitzgerald was at fault for allowing McIlroy to hit the shot. “McIlroy may have wanted to hit the shot he was presented with on the third hole - the punishment of having to chip out always seems more severe to the younger player - but JP should have seen the bigger picture” Dimond wrote. Dimond quoted fellow pro Luke Donald saying he “felt sick” watching McIlroy try the shot while commentator Paul Azinger warned that such injuries could be "career-threatening". Dimond says “Considering all that, Fitzgerald should have ensured the safety-first approach was the one that was taken. “Instead, he kept quiet - or at the least did not make his voice prominently heard - and allowed McIlroy to do the sort of damage that will almost certainly cost him his shot at this championship, and could come back to haunt him at a few more before he is fully healed. “McIlroy keeps defending his current caddie, but. ..twice in a year, his decision-making in majors has been shown to be woefully misguided. Fitzgerald has been fortunate enough to be there for one major win, but that should be it. “It might not be this week, or even this year, but McIlroy needs to change his caddie. If his on-course judgment can't always be trusted - and it certainly seems it can't - then he needs to have another one on hand as and when it is required.